Your personalized brain training program. customized just for you. Train your brain with 50+ powerful games designed by Neuroscientists! 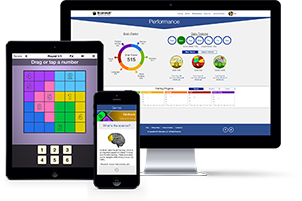 Complete the 3 game online Brainwell® Fitness Test and let us develop your very own personal brain training program. Our brain trainer uses an exclusive algorithm, which creates your personal cognitive workout. Play whenever and wherever on your smartphone, tablet and web. We’ve assembled a unique interdisciplinary team of neuroscientists, cognitive psychologists, computer scientists and game designers. 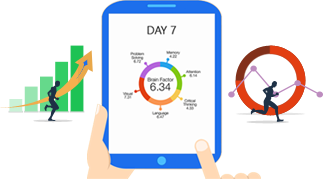 They have collaborated to provide you with exciting cognitive fitness training. He is a Clinical Professor, Department of Neurology at NYU School of Medicine. As well as Diplomate of the American Board of Professional Psychology in Clinical Neuropsychology. Each one of our exciting and unique games is based on common concepts in neuropsychology and cognitive neuroscience. Our expert team of scientists and designers convert these core concepts into original games that are engaging, challenging, enjoyable and effective. A good workout requires variety, versatility and flexibility. 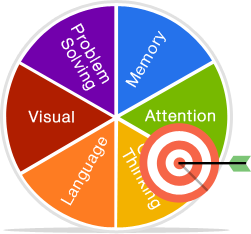 Brainwell’s® games target and challenge multiple cognitive domains. Play our games and challenge your memory, attention, critical thinking, problem solving, language and visual skills. What Are People Saying About Brainwell® ? "I find Brainwell's approach friendly, the graphics delicious, and the games fun." "Brainwell feels much more focused on what I need and want. The games are longer so I have time to really enjoy them and play. I feel like they are all more attuned to what I need which is awesome! I loved the testing at the beginning!" "The games are diverse, visually pleasing, and easy to navigate. I look forward to being able to share this app with my patients." "These games are engaging and beautifully designed." "A compelling yet also attractive series of multidimensional challenges. Bound to spark one's fascination."